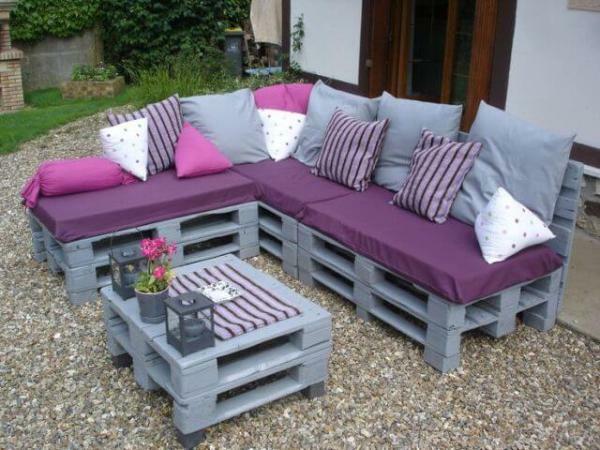 Here we are with a stylish pallet project, will be great help to get your outdoors fun-making and a bit more relaxing! 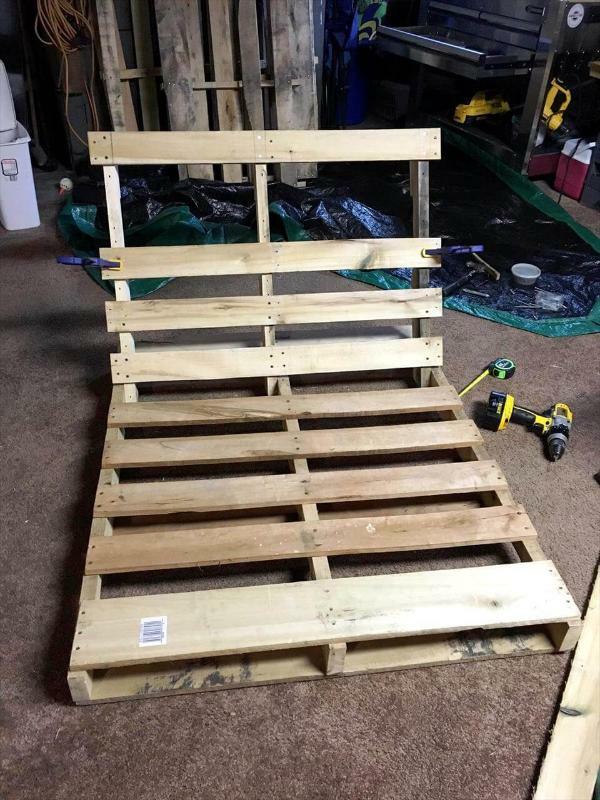 So we would like to you peek into the DIY details of this DIY pallet lounge swing tutorial, guides you for every single difficult step, you may get puzzled at during the installation! 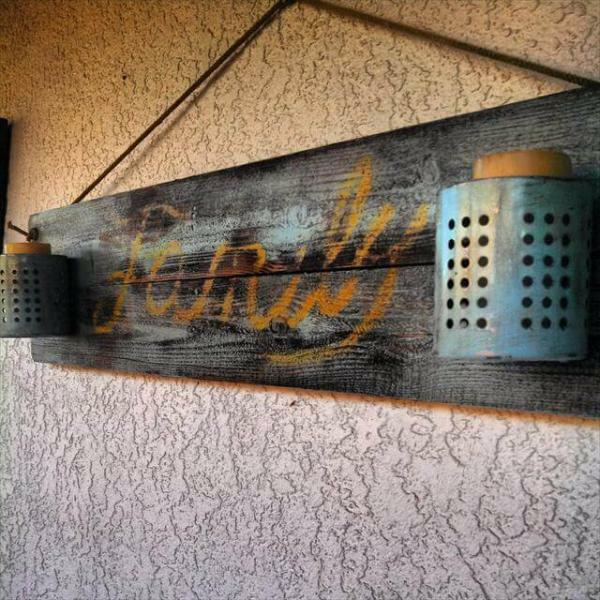 Here you are to use total 3 pallets boards, Zinsser Bulls Eye primer, and hardware and also heavy duty nautical rope! 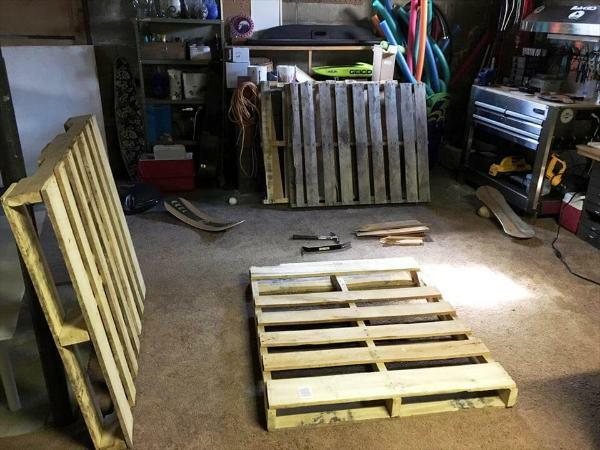 Plan 2 pallets for building seat of the swing and 1 for aloft swing frame that will allow the precise passing of rope ends to swing seat without getting them messy! 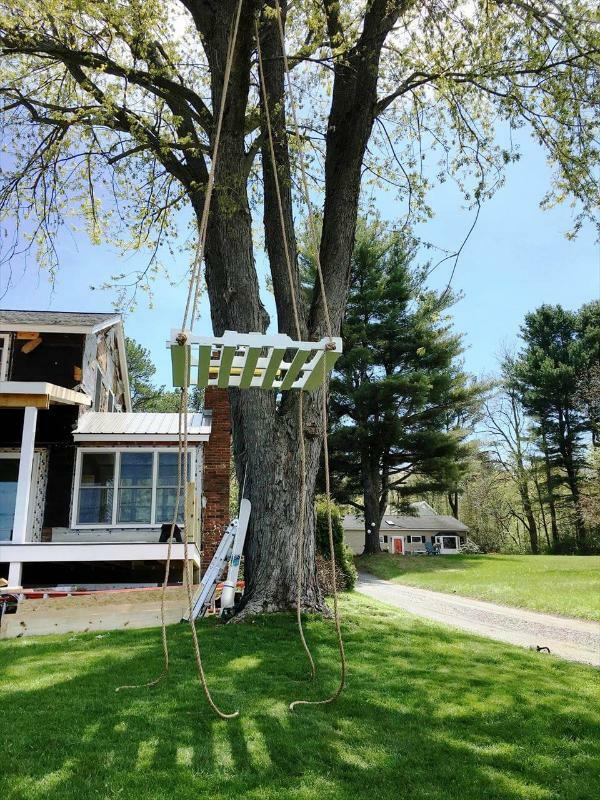 In hardware, here eye-bolts, washers, screws and locking nuts have been used for overall assembly and also to suspend the swing seat in hanging position! 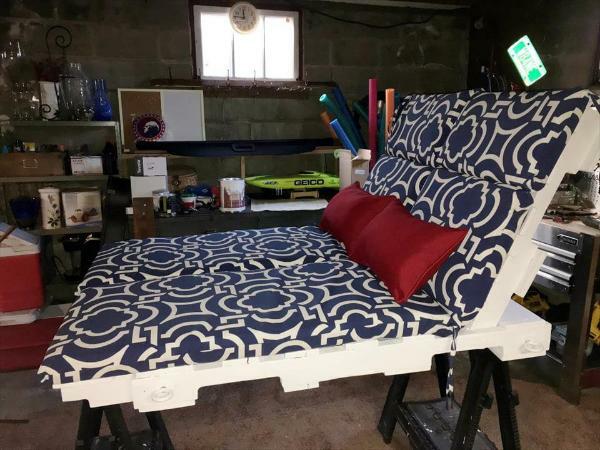 Installation if pretty simple and the tricky part is to install the backrest of the swing seat! 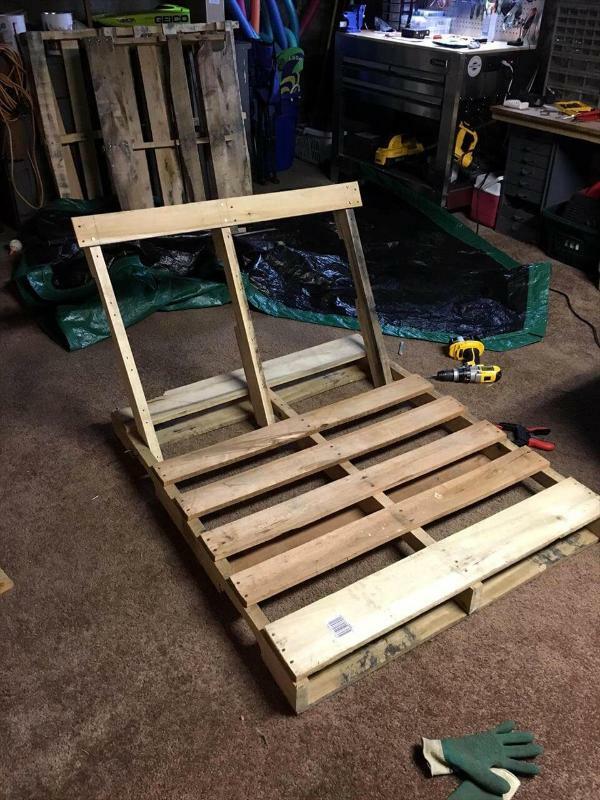 If you love to be creative, then this pallet swing project is what here you can start with, a low-cost and super comfortable lounge swing built for free! 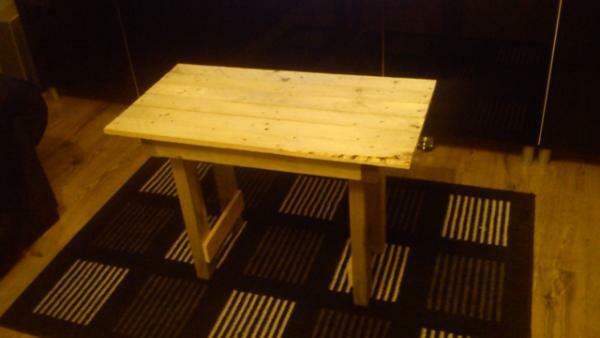 In the tools here, pry bar, hand hammer, measuring tape, screw gun, power sander, paint brush and wooden saw have been used! 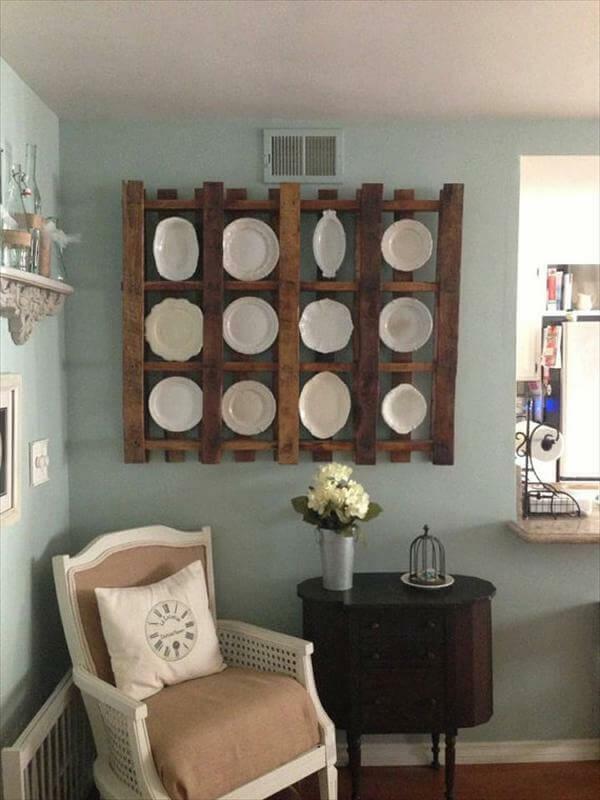 Visit the construction sites, landfills, dumpsters, junk yards, nurseries and the shipping areas to get the best and healthy looking pallet boards, here using ultra-rustic or too timeworn pallets would not be recommended to use! 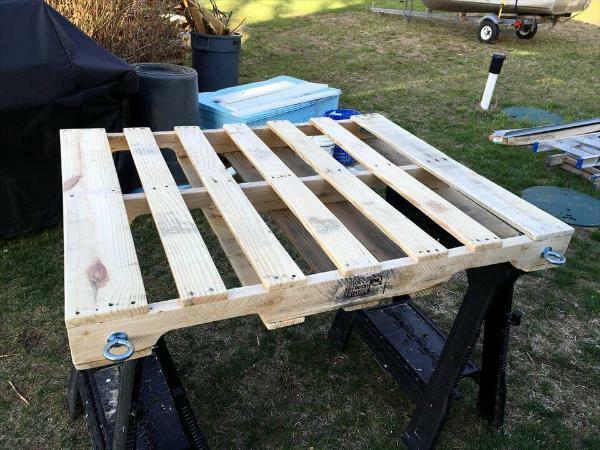 After you get the worthy pallet skids, just bright out the wood grains of it by sanding its surfaces down, will give you a clean wooden look of pallets along with zero splinters! 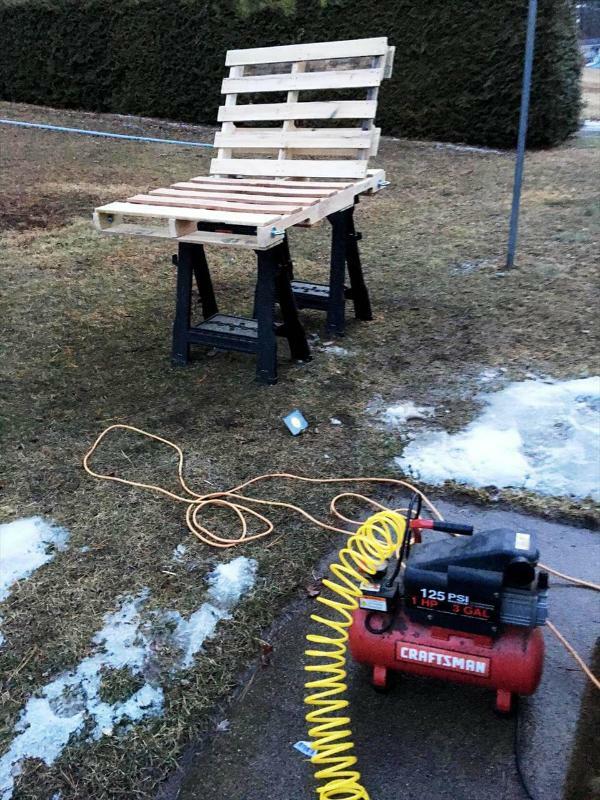 Use power sanders without doing it with hands using sandpaper, it will be faster and results would also be better! 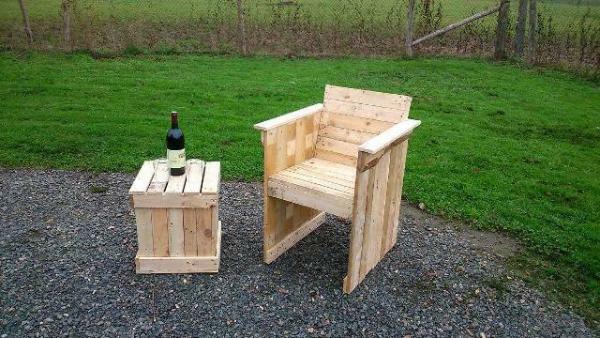 Here is the most challenging in entire construction, the installation of backrest to swing seat! 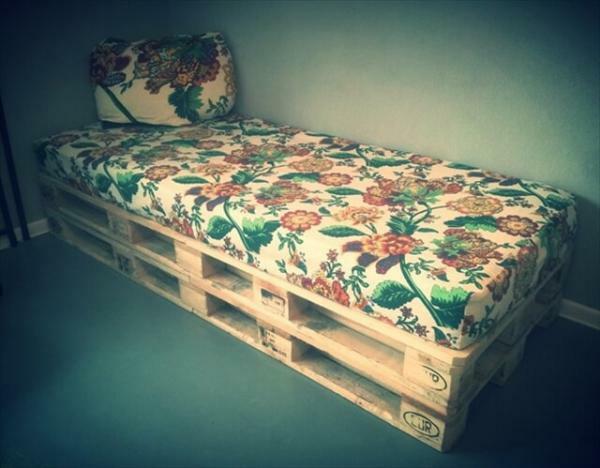 Put flat main pallet board on the floor and modify it to integrate nicely the backrest! 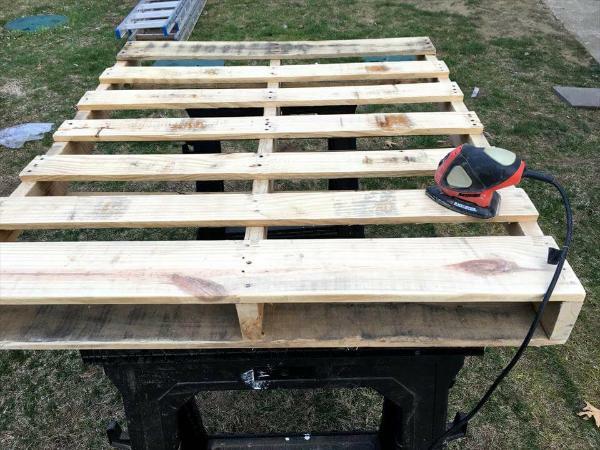 For backrest, remove the upper boards from a trimmed down size of pallet got for the backrest, do it carefully as you will have to refit those removed planks back to frame! Here removal of slats has been done only to fit the backrest frame nicely in place! 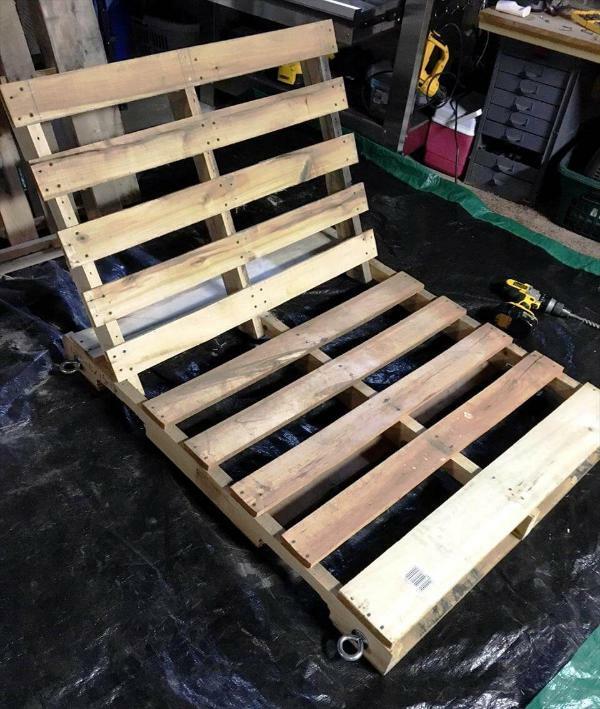 Remove one or two boards from the base pallet as shown and just fix there the backrest frame on an angle! To pluck the boards apart from backrest frame, you can take help of pry bar and hand hammer, don’t go wild as it can cause cracks in wood! 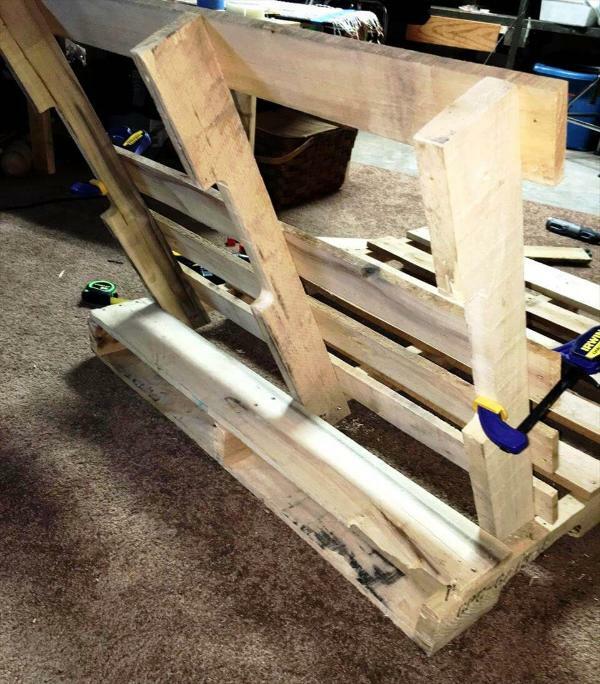 Add screws where all 3 legs of backrest frame meet the base pallet stringers, add multiple screws even the nuts or bolts to ensure lasting stability of them! 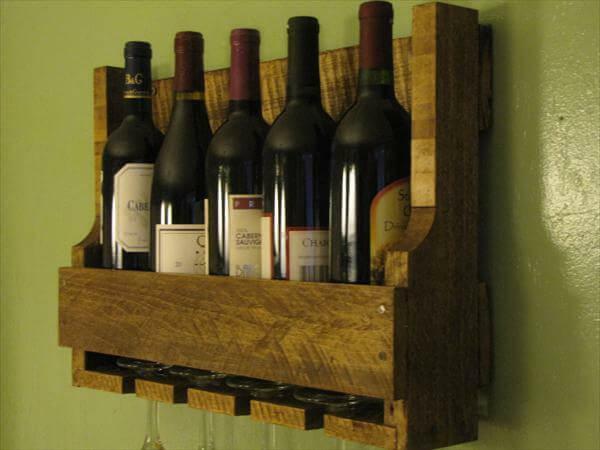 Now fit back the removed slats to backrest frame, to grip the planks in place while adding nails or screws, you can take help of some well suiting wooden system like kreg Jig, wood clamps will also rock to hold the planks in place during the assembly! 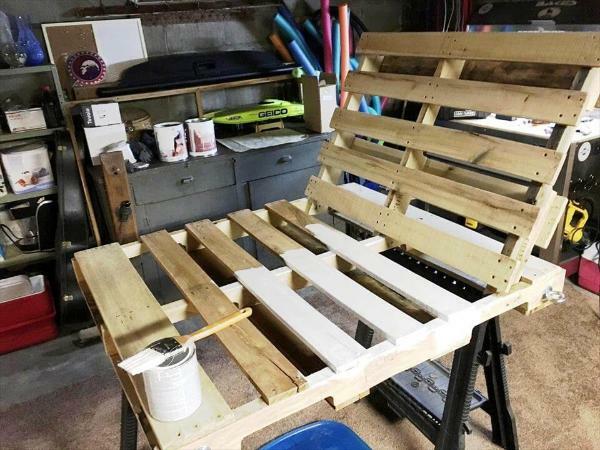 Here is a mind-blowing visual presentation of the backside of backrest, you can clear all your doubts here about the finest installation of backrest position! 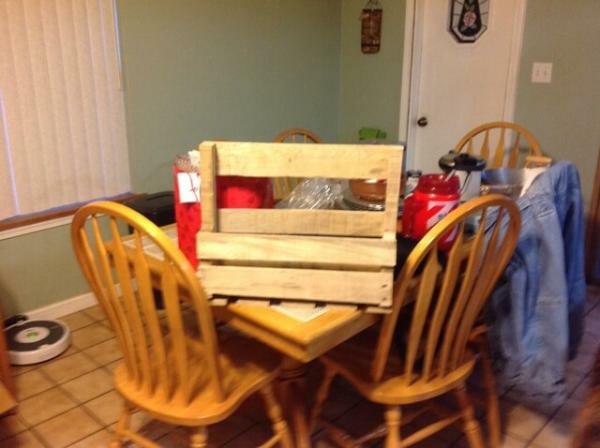 Here one pallet board has also been hired to use as a aloft frame for swing ropes, will not let the swing ropes mess up! 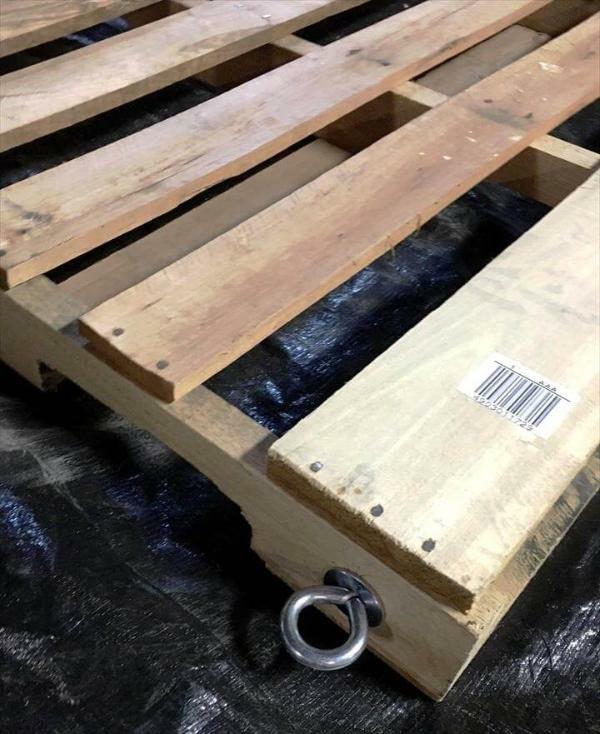 For easy passing of all the rope ends coming from tree support, 4 eye-bolts have been added to each all corner sides of this pallet! Here eye bolts have been selected to fit to each corner of the base pallet in swing seat frame! Drill the holes for adding the eye-bolts in and do add washers before you put the eye-bolts in holes, this will give them a much better grip! Lock the eye-bolts by adding nuts on the other side! After getting the swing seat ready, make a little inspection again of the attachments and hardware used, remove the errors if you find any! These hardware steel eye-bolts fitted by placing washers first, will be actually the lasting hooks there to fasten the hanging nautical ropes while intending to suspend this swing seat in the air! 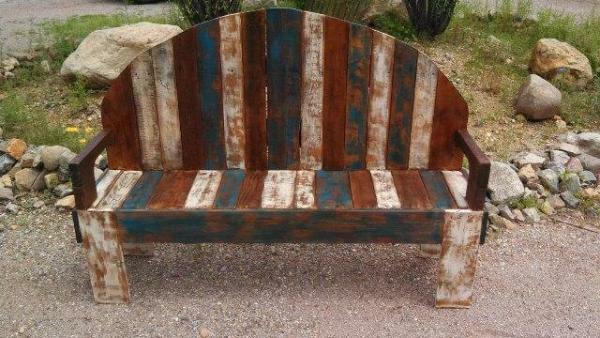 After a overhaul, the next think would be to apply the primer coats to hand-built swing seat, here Zinsser Bulls Eye primer has been used and coats have been applied using a paint brush! 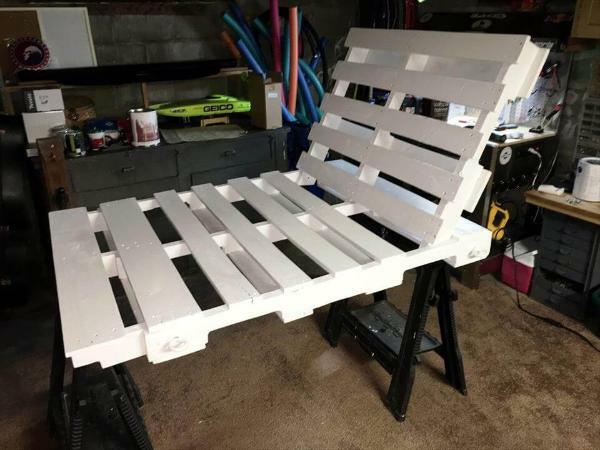 Let the wood dry for sometime after applying each coat and then apply the next coat, here after a few coats, enriched white look of swing seat has been gained as you can see below! 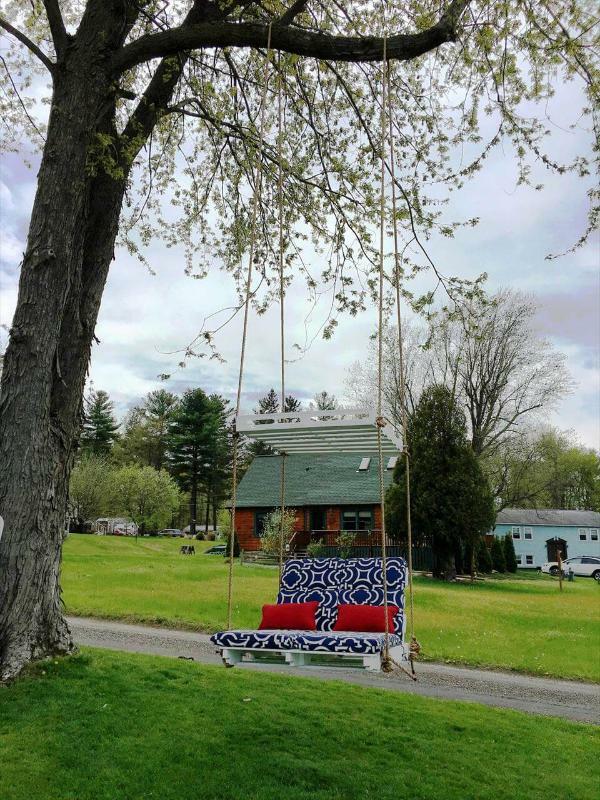 After primer you can paint the swing seat in any vibrant color but here alluring white has been selected as the final color of the swing seat, really looks beautiful at outdoor! 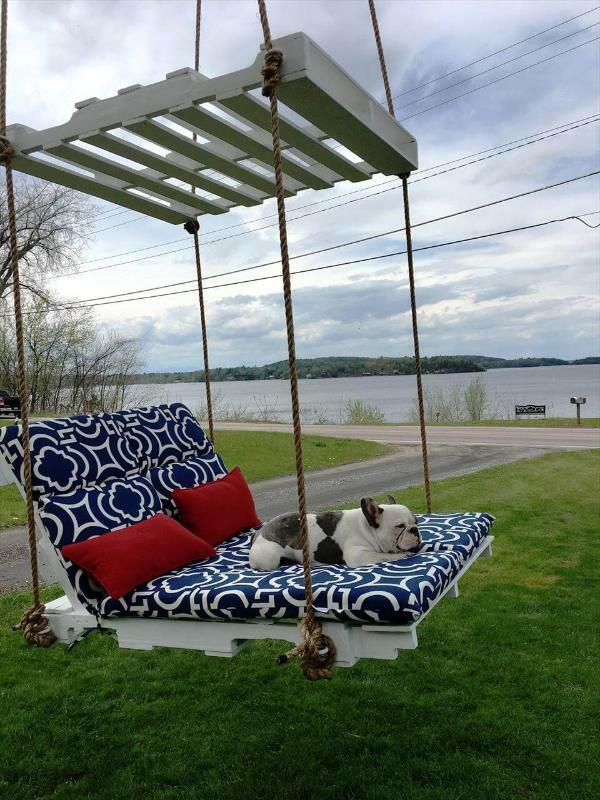 Get the foam mattress or cushions to raise the comfort of the swing seat to a next level, comfy it up also by adding pillows, here red pillows have been thrown over the cushioned swing seat! 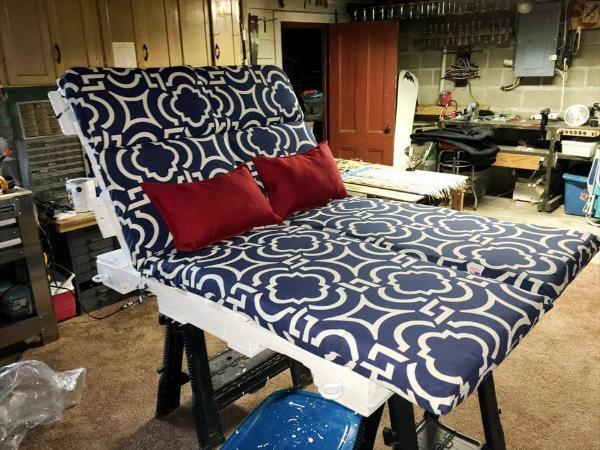 After adding pads, mattress or cushions to seat, the seat would be all ready to hang! 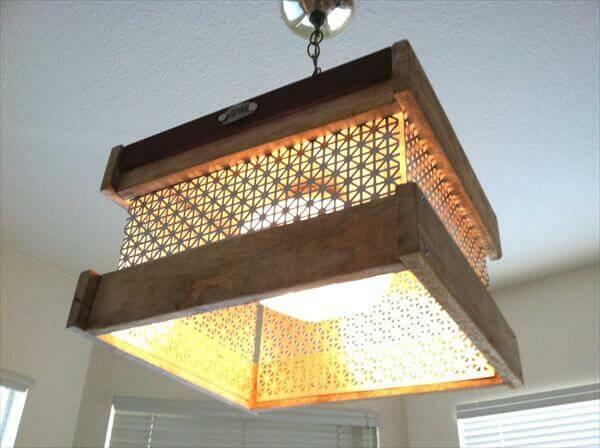 You can use the nautical rope or heavy duty metal chain for swing-hanging! Here nautical rope has been used and cut into required lengths for super stable hanging of swing seat! A thicker tree branch has been selected here as an aloft support for swing and the all 4 rope ends coming from the tree branch passes through a pallet-made frame first, help to avoid the random mix-up or intermingling of swing ropes! Here ropes coming finally from the suspended frame, have been fastened tight to eye-bolts fixed in the swing seat and swing is all ready to make you enjoy all the day long! 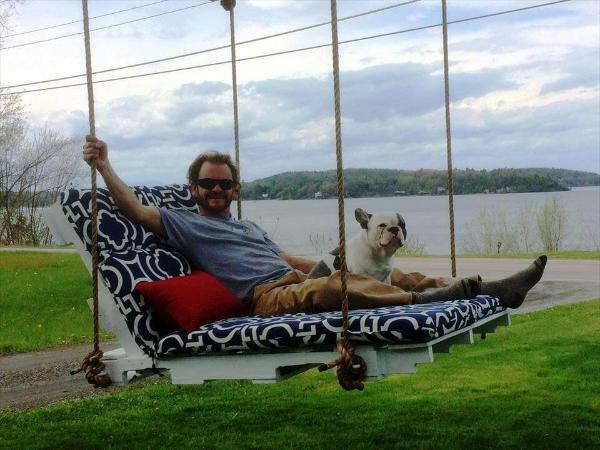 Not only for mature outdoor lovers, this swing will also be a fun-making platform for all those pet-friends and also for your naughty kids! You will get this swing a mind-blowing relaxing station to sooth your nerves by staring at the serene outdoor environments, would also be amazing to read books you like! 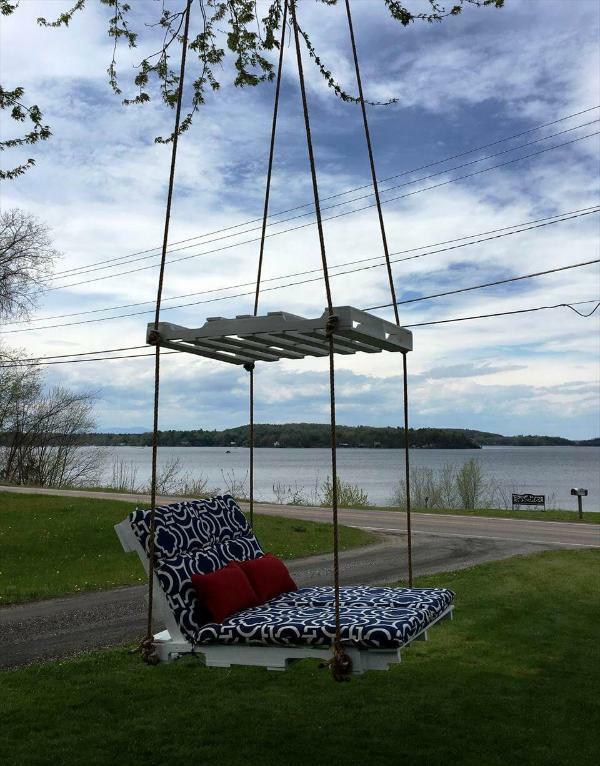 You will also find this hanging pallet chair swing a great friend for daydreaming, it would be something at your outdoor, you will find most worthy to feel comfortable and to get clam down in no time!